Human beings will return to the Moon. We don’t know when it will happen, but with this book, Lunar Settlements, we can learn from experts how to build the habitats, manufacturing operations, power, and transportation systems needed to live there. 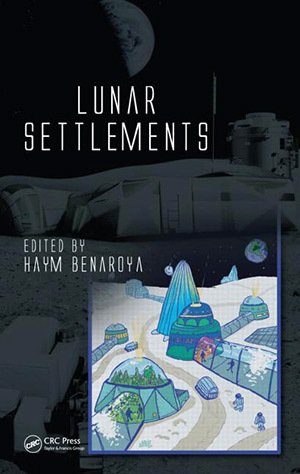 The book is a compilation of papers from the 2007 Rutgers University Symposium on Lunar Settlements, edited by Haym Benaroya, professor of mechanical and aerospace engineering at Rutgers University. The included proposals are written by highly credentialed engineers, astronauts, and scientists from around the world. Paul Eckert, Ph.D. spoke about “attracting private investment for lunar commerce.” Charles Lundquist, Ph.D. discussed the “Apollo knowledge transfer” for application to today’s technology. Paul Lowman, Jr. of Goddard Space Flight Center presented the case for a base at Malapert Mountain in the south polar region of the Moon. Most people interested in the settlement of the Moon — and the authors of these papers — agree that in-situ resource utilization will be vital for success. Lunar regolith is often proposed as a structural building material, and as built-up shielding against solar radiation and meteoroids. Scientists have studied the chemical makeup and mechanical properties of the Apollo lunar samples, and one paper presents the calculations showing the failure modes and structural reliability limits of lunar soil used for construction. Another paper, presented by François Levy and John Fardal, even considers the effects of radon 222 exhalation from the regolith on indoor air quality. To reduce this problem, they suggest increasing the density of the regolith or covering interior walls with flexible thin-film membranes. Before anything else, we must get to the Moon and be able to travel across the surface. 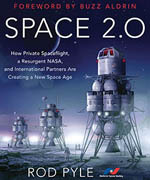 The papers in this book present lunar transportation in the form of 21st century lunar modules, horizontal slide landers, surface roving cars, suspended tramway systems, and a lunar space elevator. Power generation for these needs will come from solar and He3 fusion as presented at the Rutgers Symposium by NSS Governor and Apollo 17 Astronaut Harrison Schmitt and in his book Return to the Moon. 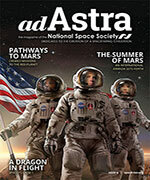 Lunar dust contamination has concerned many settlement advocates, and the book sets out the potential for several mitigation techniques such as air locks, regolith bagging, and scraping away. Microwave sintering technology proposes to melt the surface, thereby controlling dust and creating roadways, landing pads, and building sites. Human factors, of living in the extreme unusual environment of lunar settlements, are analyzed through physical and psychological interactions. Living space for everything from life support systems and facilities for basic human needs to the interior visual environment will be carefully constructed. Designers will use light and color, art, and natural elements to enhance and maintain the physical and psychological health of the crew. Scientific research opportunities abound at a lunar base; lunar geology, sustained food growth, and atmosphere-free astronomy are just a few options. One paper suggests a Protected Antipode Circle, which would have no radio frequency interference, on the Moon’s far side. It is easy to contemplate the grand discoveries to be made from such a pristine observatory on the Universe. Generations of humans have dreamed of living on the Moon. Editor Haym Benaroya is helping to bring that day closer with this highly readable book. These are not fantasies of the imagination, but detailed proposals based on research, testing, and analysis by distinguished scientists and engineers. Lunar Settlements is a great resource book, but it also creates a growing excitement as one realizes that these papers represent the collective wisdom of the people who know how to get humans to the Moon, this time to stay.